A disappointing first half ended on a high note, with Sunday's walk-off grand slam capping a 9-2 home stand to propel Minnesota into the All-Star break with some serious good vibes. In the wake of a crushing 1-8 road trip, the Twins did what they needed to do, taking all three series at Target Field to move back within six games of .500 and eight games of the division lead. The offense was cooking this week, producing 48 runs in seven games. The unit's fine work included strong showings against two of the American League's hottest starters; Minnesota chased All-Star Blake Snell (4-0 with a 0.63 ERA in his previous four starts) after three innings on Thursday, and jumped all over Nathan Eovaldi (2-0 with a 0.95 ERA in his previous three starts) for eight runs on Friday. Contributions came from all corners. Jake Cave continued to entrench himself with his best week as a big-leaguer, starting five of the Twins' seven games and going 8-for-17 (.471) with two doubles, two triples and a pair of runs batted in. It'd be nice to see a little more discipline – he drew one walk last week and has only four in 81 plate appearances, to go along with 23 strikeouts – but at least he's connecting and driving the ball. Cave is looking like a hell of a find by the front office. It's that time of year: Brian Dozier is finding his zone. The now-customary slow start for Dozier was lengthier and uglier than usual this time around, but as usual, he's finding his stroke here around the All-Star break. Last week he went 9-for-28 with three home runs and 10 RBIs, punctuating his first half with a walk-off grand slam. He also showed a better eye at the plate, drawing five walks (one intentional) after posting a 9-to-0 K/BB ratio the previous week. Speaking of reviving patience, Joe Mauer drew twice as many walks from Friday through Sunday (4) as he had in 24 previous games since coming off the disabled list. Coupled with his generally exceptional output during the week (11-for-30 with a homer and seven RBIs), it's a further sign Mauer is starting to see the ball better – a much-needed development. Also chipping in on offense: Eddie Rosario, who had at least one hit in all seven games and now ranks 8th in the AL with a .311 average. Robbie Grossman who hasn't seen his name pop up in the "Highlights" section often but earned it this week by going 8-for-18 (.444) with three doubles and three walks. Heck, even Bobby Wilson joined the fun, following up his first multi-hit game of the season last Saturday with two more in his four starts. His average is all the way up to .177! On the pitching side, Kyle Gibson stayed hot with another brilliant performance on Thursday against Tampa. The righty struck out nine and walked none over eight innings of one-run ball, inducing 16 swinging strikes after setting a career-high with 20 in his previous turn against Baltimore. Gibson has completed seven or more innings six times in his past nine starts; he did so nine times in 2016 and 2017 combined. Right now, Gibby is throwing as well as he has at any point in his career. The timing is interesting as the trade deadline approaches, with Minnesota in sell mode (?) and plenty of contenders seeking impact arms. We'll see what happens. Mitch Garver continued to come up on the short end of the catching timeshare, making three starts to Wilson's four, and for once he was actually out-hit by his counterpart. Garver actually failed to pick up a single knock in 17 plate appearances. That sort of thing is going to happen – his .375 average in the previous 20 games, buoyed by a .432 BABIP, wasn't going to stay propped up forever – but what's nice to see is Garver taking solid ABs and still managing to get himself on base during a hitting slump, as he drew four walks against four strikeouts. He also laid down a key two-strike bunt on Sunday to set up Dozier's walk-off. Even during a down stretch, it's nice to see Garver get playing time, and it's easy to see the value in it. That's not true of Matt Belisle, who has now become a primary source of frustration with this club. 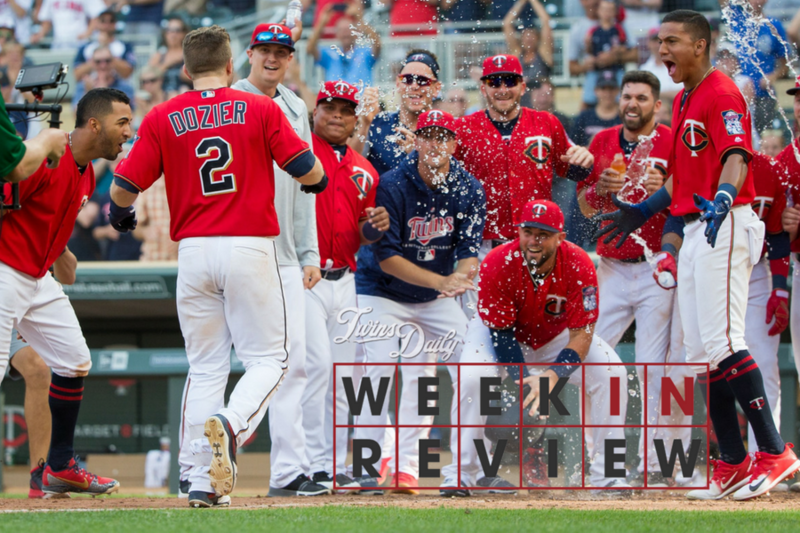 When the Twins added the veteran right-hander back in early June, seeking an infusion of leadership to right their wayward ship, it appeared to be a harmless enough move. He hadn't been good with Cleveland but he was to be the last option in the Minnesota bullpen, a mop-up man whose arm they didn't need to worry about. How much damage could he do? Well, he's done his share. After a hideous outing on Saturday in which he coughed up five runs in one frame, pushing the game out of reach and opening the door for an ill-equipped Willians Astudillo to take the mound in the ninth, Belisle has now surrendered 13 earned runs on 23 hits in 12 1/3 innings for Minnesota. He hasn't recorded six outs in an appearance. If he's still on the roster coming out of the break, the Twins are doing it wrong. On Sunday, Ervin Santana made his first rehab start at Triple-A, stretching out to 5 2/3 innings and 86 pitches. The results weren't great – he gave up a pair of homers and has allowed five total in six starts in the minors. However, his arm strength should be sufficiently built up to rejoin the big-league club and I don't suspect the Twins will waste any time. He'll likely be reinserted into the rotation immediately after the break for two main reasons: 1) they're having a hard time finding answers for that fifth rotation spot, as Aaron Slegers was shelled on Tuesday and Fernando Romero couldn't get through five innings on Sunday, and 2) they have precious little time to showcase Santana as a deadline chip. Santana may quietly be one of Minnesota's best assets to dangle. He was among the AL's top pitchers last year and started a playoff game. He's an experienced vet with an excellent recent track record. His contract, containing a $14 million team option for 2019, offers convenient flexibility. And if other teams are convinced he's beyond his finger issues, they might actually value the fact that he has hardly pitched all year, as it could improve his odds of staying strong through September and October. Of course, convincing others that Erv is back to 100% will be tough as time runs short. Reports on Santana during his rehab stint have been as mixed as his results. He is lined up to start the first game of the second half on regular rest, and if the Twins plug him in at Kansas City on Friday he'd be able to get in three turns before the July 31st deadline. Would a trio of 2017-caliber efforts be enough to restore Santana's status and generate some competition for his services? That should certainly be the hope as we look ahead to the rest of July. At long last, Royce Lewis received his much-deserved promotion to Fort Myers. In moving up from Low-A to High-A, Lewis becomes one of the youngest players in the Florida State League, but that didn't stop him from making a fast impression with four hits in his second game on Sunday. Lewis was, of course, the consensus No. 1 prospect in our recently wrapped midseason top 40 rankings. While the shortstop was bursting onto the FSL scene Sunday, Alex Kirilloff wasn't in the same lineup, because he was starting for Team USA in the Futures Game. He started in right and batted sixth, notching singles in both his at-bats before coming out. Also participating in the showcase was Lewis Thorpe, who didn't fare so well – he came in to pitch the fourth but couldn't complete it as he yielded four runs three hits, including a single to Kirilloff and two home runs, while recording two outs (both on K's). On Tuesday, Jose Berrios will represent the Twins at the 2018 All-Star Game. Then, following a couple days off, the second half will kick off with a series in Kansas City. Minnesota needs to make hay against the last-place Royals because after that the path steepens, with their road trip bringing them through Toronto and Boston before returning home to face Cleveland. The probable starters below are very much subject to change as both the Twins and Royals may reshuffle their rotations over the break. TUESDAY, 7/17: MLB ALL-STAR GAME – Go Berrios! Game 91 | MIN 5, TB 1: Who’s the Snub? You always wonder about the prospects, but the Twins seem to short leash them these days, although SLegers did get a second start and bombed after an excellent first start, shades of 2017. Still, decisions need to be made going forth. Romero may have been tired and rushed, coming uo direct from the minors and thrown into play, but still....the message is there...produce and you stay in the majors. Don't produce, you go down the next day. And even players like Jake Cave have to know that at some point, they may fall to the numbers game (and the desire to keep Robbie Grossman's bat) and no matetr how well you might be playing (remember Ryan LaMarre), you can get demoted. Yet Wilson remains. Belisle pitches. And Willians still hasn't put on a cather's mitt. The Twins do have to remove free agent assets: Dozier, Lynn, Rodney (perhaps), Duke. Morrison and Reed probably should be gone, too. All will walk at season's end. What is the value (monetary) for an Escobar contract. You probably do keep Mauer and let him play out his career in Minnesota because "who's on first?" The Twins gain service time credit on Buxton, Sano is doing whatever in the minors, both not talked about much these days, for some odd reason...the talent IS there. Boston, Toronto and Cleveland could sink the Twins, who still have 30 or so games left in the season against weaker teams. And Willians still hasn't put on a cather's mitt. Why would Astudillo put on a catcher's mitt? He stopped playing catcher in AAA four weeks before his first appearance in the major leagues. Since June 2 he played primarily 3B with a couple of starts in LF and one a DH for Rochester. They gave him two months at AAA to show he was an acceptable catcher. The staff moved him off of catcher and to 3B. Why would they move him back once he hit the majors? I can see how we might question Molitor if he played him at catcher and ignored what was learned in Rochester. I don't get the persistent questioning of why Astudillo isn't getting a chance at catcher. He had a chance for two months before they moved him to 3B. I don't get the persistent questioning of why Astudillo isn't getting a chance at catcher. He had a chance for two months before they moved him to 3B. If the catcher position wasn't such a drag to the current lineup, I doubt it would come up as much.A quick glance at Astudillo's AAA offensive output and the "C" next to his name in the position column are enough to make someone hope he can be the answer.If someone does their homework like yourself, they would realize the folly of placing Astudillo behind the plate at this level.At least the one who makes the decisions does know.That was quite obvious when the Twins gave up the DH the other day to let Garver move to catcher after they ran for Wilson. Love to root for him though, and my neighbor nicknamed him "Build-A-Bear". If we’re really gonna go for it, it’s gotta start with dumping Wilson and Morrison, and replacing them with competent veterans such as (catcher) Russel Martin and (RH power bat) Mark Trumbo. The Twins beat up on 2 of the historically worst teams in MLB history.....I hope the FO isn't fooled by that. a bit strong, at least in July. Regardless, W's count the same no matter who you get them against.And 3 of 4 from a TB team above .500 i the AL East doesn't count either? Of course they count, but they aren't particularly predictive. and, they are on pace for 110-120 losses, so, not an exaggeration. Historically bad. The next worst teams have won 50% more games than they have. Maybe Toronto eats most, if not the entire contract, if we send back a quality prospect that’s irrelevant to our future plans, someone like Blankenhorn. They moved him because there were too many catchers in AAA and they needed his bat in their lineup. There are still 2 or 3 catchers in AAA right now. Just when I thought I was out, they pulled me back in !